If you are afraid of catastrophes, stop reading, now! This is the portrait of two experts in upheaval, disorder, blunders, upsets, trouble, disturbance, disruption, confusion, misunderstandings and arrogance. They appear in 20 of the 24 Tintin books, they are the heroes of a serialised story in which they star, and they are also actors in two plays. The Thom(p)sons are more than merely useful to Hergé, they are an indispensable link in the saga devised by Hergé. In 1932, in Cigars of the Pharaoh. two policemen arrest Tintin, whom they caught with incriminating evidence. At that time they were simply known as X33 and X33A. We had to wait until King Ottokar's Sceptre to learn their real names. The only way to distinguish between them is by the trim of their moustaches. Thompson's (X33) is neatly trimmed, whilst Thomson's (X33A) has a distinctive twirl at the ends. What are these policemen doing? Give them a mission, and they get into an even bigger muddle in an already complicated situation. If they are supposed to be discreet, they make themselves even more conspicuous. Courageous but not reckless, they end up afraid of their own shadows, or even their own X-ray images, as in Destination Moon. 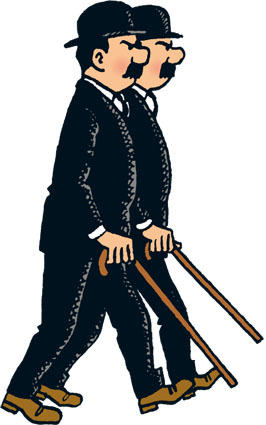 Hergé's father, Alexis Remi, had a twin brother, Léon. They were identical twins, and both had moustaches and dressed alike. They always wore a boater or bowler hat, and never went out without their walking canes or umbrellas. Although Alexis and Léon Remi were brothers, the Thom(p)sons are not. One is named Thomson and the other Thompson. Twins? No. Doubles? Yes! Did policemen really dress in a black suit, white shirt and black tie, bowler hat, hobnailed boots and armed with a walking stick? Yes! If you look at photos taken at the beginning of the 20th century, you will see that there were French and Belgian policemen dressed in civilian clothes, always in black suits, which became a sort of uniform. They were always recognisable. Why clothing that is so easily-recognisable? At the time, policemen were given a small subsidy for their "work-clothes", which they had to buy themselves. The thick black cloth was the cheapest available; most policeman wore it, along with hard-wearing hobnailed boots. A moustache was the mark of a man. Just look at the fine specimen worn by Police Officer 15 from the Quick and Flupke series, which was published from 1930, two years before the Thom(p)sons first appeared. Behold the ancestor to Thomson and Thompson's moustaches! Hergé was a big fan of the movies, and made no secret of his admiration for burlesque humanism, particularly the type of comedy, free from maliciousness, and with the narrative rhythm created by Charlie Chaplin in his films. Most of the policemen who made life miserable for the poor vagrant had big moustaches. However, if we want to trace the genealogy of the Thom(p)sons, we will certainly find Laurel and Hardy. Same bowler hat, identical expression of repentance of children caught red-handed with their hands in a bag. The Thom(p)sons were part of Tintin's world since 1932, but they were also the heroes of a serialised story entitled, Thomson & Thompson, Detectives, which was written by Paul Kinnet and illustrated by Hergé. This illustrated story appeared in the daily newspaper, Le Soir, in 1943. They also had the opportunity to tread the boards on two occasions, when, in 1941, Hergé teamed up with Jacques Van Melkebeke to write two plays, Tintin in India (or The Mystery of the Blue Diamond), and Mr. Bullock Has Disappeared. They are so keen. The trouble with the Thom(p)sons is that they are so noticeable when they are attempting to be inconspicuous. Hergé used the Thom(p)sons' disguises to poke some gentle fun at the simplistic views of far-off lands held by his contemporaries. People didn't travel much before the 1960's. A constant theme in Hergé's work is breaking down prejudices, using humour as a powerful weapon. Some examples: At the beginning of Land of Black Gold, the Thom(p)sons experience the sabotage of their car fuel. Their car engine explodes, like Charles Trenet's heart in one of his famous songs. In the same book, they are victims of a chromatic mutation in their capillary system. The unexpected anarchic growth of their hair, which gives them the appearance of mammoths lost in the 20th century. If that wasn't enough, they suffer a relapse thousands of kilometres from Earth. When the Thom(p)sons are on their way to the Moon, their hair and beards start growing again at a rapid rate. To crown everything, in the land of the Picaros the two brave detectives come very close to death at the hands of a firing squad. If you want to experience a collection of misunderstandings, open Prisoners of the Sun. Whilst they are looking for Tintin, Calculus and Haddock, who have disappeared in Peru, the Thom(p)sons embark on a world tour in their search. How does this happen? Due to their constant misinterpretation of the clues they find. It's not enough for them to see a mirage. In The Land of Black Gold, they even attempt to dive head first into one. Thanks to their stupidity, they are looking at a mirage, and are brought back to reality when they fall flat on their faces. The Thom(p)sons, not courageous? Who would dare say sucha thing, when one adds up the stunts that they have carried out in 20 books? If they go on a trip to the Moon, it's because they fell asleep in the space ship. If they beat the record for the fastest descent of stairs, it's because they missed the first step. If they perform aerial stunts, it's because they forgot to fasten their seat belts. It is not often that the phrases of comic book characters end up as part of everyday language. However, the Thom(p)sons manage to do this in French. A couple of excellent examples, translated into English, are: "That's my opinion, and I agree" and "Here we are on the Moon, where the hand of man has never set foot!" Hergé's only rival in the creation of common phrases and terms found in everyday language, is without doubt, the Dutchman, Marten Toonder, whose creation, Heer Bommel, has enriched the Dutch dictionary. "Dupont & Dupond" in: French, Italian, Portuguese, Catalan, Basque, Romanian, Danish, Swedish, Norwegian, Finnish, Estonian, Hungarian, Turkish, Azerbaijani, Persian. "Jansen & Janssen" in: Dutch. "Uys & Buys" in: Afrikaans. "Shultze & Shulze" in: German. "Skapti & Skafti" in: Icelandic. "Johns & Jones" in: Welsh. "Mac Grianna & Ó Grianna" in: Irish. "Hernández & Fernández" in: Spanish. "Ntypón & Ntipón" in: Greek. "Tomsonas & Tompsonas" in Lithuanian. "Dyupan & Dyupann" in Russian, Ukrainian. "Dziupan & Dziupann" in Belarussian. "Tajniak & Jawniak" in: Polish. "Kadlec & Tkadlec" in: Czech. "Horváth & Horvát" in: Slovak. "Petek & Svetek" in: Slovene. "Šiljak & Žiljak" in: Croatian. "Thomasan & Thompasan" in: Hindi. "Johnson & Rohnson" in: Bengali. "Tik & Tak" in: Arabic. "Depot & Depot" in: Hebrew. "Dùbāng & Dùpáng" in Mandarin. "Dwipong & Dwippong" in Korean. "De~Yupon & De~Yubon" in Japanese. Yah 100%!!! Pent courcent je dirais même plus! My favorite character of all time! hi dupondrocks! i like your name. dupont and dupond rock!!!! dupont and dupond rock! i'm their number 1 fan!